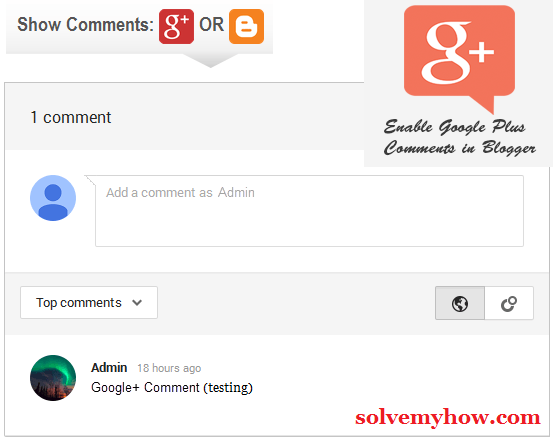 enable google plus comments in blogger. Well after starting a blog, the first thing you want is traffic right ? But for that you really have to work hard on your SEO and on various other important parameters of your blog. Blogging is really incredible, once you know how to use it properly or I say once you know how to optimize it properly. Even the basic intention behind creating solvemyhow is solving each and every possible blogging how. If you are still thinking how to start a blog, then you can read the solvemyhow >> blogger category. This will really help you to optimize your blog and this will also help you to drive more traffic on your blog. I had already discussed some important and recommended widgets which you must install to get high PR and traffic on your blog. Today we are moving a step ahead in improving your blogger blog by adding an awesome google plus comment box. Must read the below mentioned tutorials, in case if you missed the necessary widgets to install on your blog. These are the few must needed things on your blog, if you want it money making blog. So, today we will see how to add or enable google plus comments in blogger blog. Well why do we need this thing ? Have you ever thought how much UI (user interface) plays an important role ? Consider a scenario where your visitor might wanted to comment on your blog but what if he/she doesn't like the UI, well obviously they won't leave the comment right ? But what if instead you install google plus comment box which gives more awesome font, comment moderation, shareable features, etc. Your visitors may like to comment more on your blog after this. I'm not saying there are only pros in this. There are cons in this too. So, lets see all the pros and cons before installing this plugin on your blog. Comments are lost as soon as you change the url. You can't take backup of discuss, faceboook comments. They all will be deleted as soon as you install this comment box. Add google plus comments on blogger blog. Add facebook comments Box on blogger blog. Add disqus comments on blogger blog. To install this widget on your blogger blog is really easy. You just need to follow the step by step guide mentioned below. P.S : This feature will work only on those blogs which are associated with google plus. As now, all the blogger blogs are updated and they all are associated with google plus. So, no need to perform any extra action for this. Step 1 :- Login into your blogger account. Step 2 :- Go to Google+ section. Step 3 :- Tick the Checkbox "Use Google+ Comments on this blog". 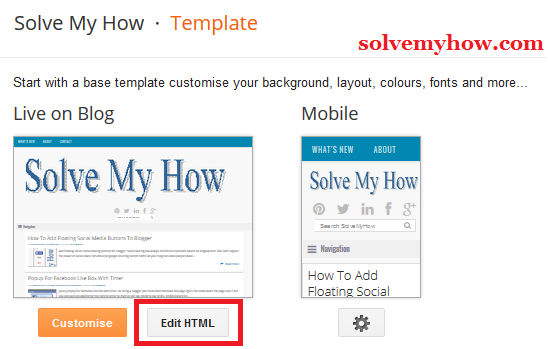 Note :- If you're using custom blogger templates like solvemyhow then this feature may not work as designer might had kept some limitations. So, in this case we manually have to edit blogger template. Follow the steps mentioned below. Step 4 :- Go to your blogger template. I recommend you to take backup of your blogger template before making any changes into it. Step 5 :- Find the below mentioned code in blogger template. Simply press ctrl + f and paste the below mentioned code and then press enter. Step 6 :- Just after it on the very next line, paste the below mentioned code. Note :- You may find more than one occurrence of <div class='post-footer'>. So in this case paste the above mentioned code after each and every occurrence of <div class='post-footer'> . Step 7 :- Save the template. Just visit your blog to check whether it is successfully installed or not. You can also get the same code from support.google.com forum. That's it, you're done. Congratulation your have successfully installed the widget. So this was all about how to enable google plus comments in blogger blog. I hope this widget will definitely attract your visitors to comment on your blog. I put lot of effort to write these type of tutorials so please consider it sharing with your social media friends. You can also subscribe for solvemyhow newsletter to get latest blog optimization techniques, blogger widgets, SEO and hacking tips right into your inbox.